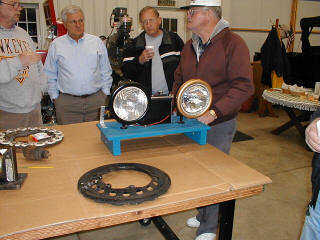 The April meeting was held at Jack Putnam's shop in Bluffton. Bob Torbet led the meeting with 15 members and guests in attendance. The treasurer's report was read and approved. Bob Hollister gave a report on the tech meeting at his home during March. Everyone had a good time and another T is almost ready to start touring. The next tech meeting was set for 9:30 am 4/26/03 at Bill Phillips home in Findlay. The project was to be "get his coupe running". The idea of some summer touring was brought up by Bob Torbet. There has been an island tour suggested for sometime in September or October. This will be after the active tourist season on Kelly's Island; so, we shouldn't have much traffic. The MTFCI application has been accepted and confirmed. As noted at the top of this page, the Model T Club of Northwest Ohio is now affiliated with both the MTFCA and the MTFCI. We will make a formal presentation of the documents at the May meeting. The Ford Motor Company has contacted me about our club helping out with a part of the Ford 100 Year Anniversary celebration that is to be held in Toledo, Ohio. They are celebrating the Anniversary in 100 different cities around the country and will be in Toledo on May 16th at the Toledo Botanical Garden. They are, of course, interested in seeing our cars; but, would also be interested in any type of display that we could come up with to show the history of the Ford Motor Company. The event is to run from 10:00 am to 3:00 pm with special consideration given to old car owners. We will discuss details at the meeting. Questions can be directed to Jim Cook. Another upcoming event is a Ford celebration at Findlay Ford. Stan would like us to come to Findlay to help celebrate the 100 Year Anniversary instead of going all of the way to Detroit. He will provide lunch and Ford Memorabilia to those who participate. The date is Saturday, June 14th at Findlay Ford Lincoln-Mercury. Every tech meeting that we've had has been informative as well as fun. The meeting at Bob Hollister's was also filling. While we work on the Model T's something new always comes up. No two Model T problems are the same; and, the more experience that we have with them, the more we learn. It has been this writer's experience that Model T owners don't work on their cars because they have a feeling that they'll do something that is irreversible. This is rarely the case with a T. They can be put together backwards and still seem to run fine. Tech meetings are a chance to get your hands dirty on someone's car and gain valuable experience while under the watchful eye of a few more experienced mechanics that can bail you out if a problem should arise. Whether its changing out engines or just adding an outside oil line, every T is just a couple hours away from being a fun machine. Just ask Bill Phillips about his afternoon drive this past month. His car still needs a little work; but, it's running and drivable. I'm expecting to see Bill on tour with his coupe this summer. I've also worked on Herb Neal's 1925 couple during the last month. Herb uses his car as a chick magnet. The older ladies just love to go for rides with him in his 1925 green wheeled coupe. This car hasn't run on magneto for some time. 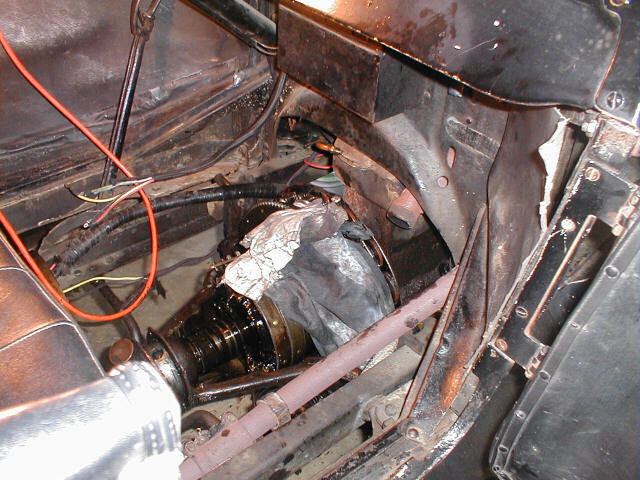 A rag tied onto the magnet and turned through the oil sump revealed all sorts of junk, including copper windings from two coils and a few pieces of ring from a blown cylinder. Michael Koumas has a touring that has been refurbished this winter from the engine, transmission, rear end, and Rocky Mountain Brakes. Let us have the next tech meeting in your garage or we'll bring your car to Jack's for some fun! 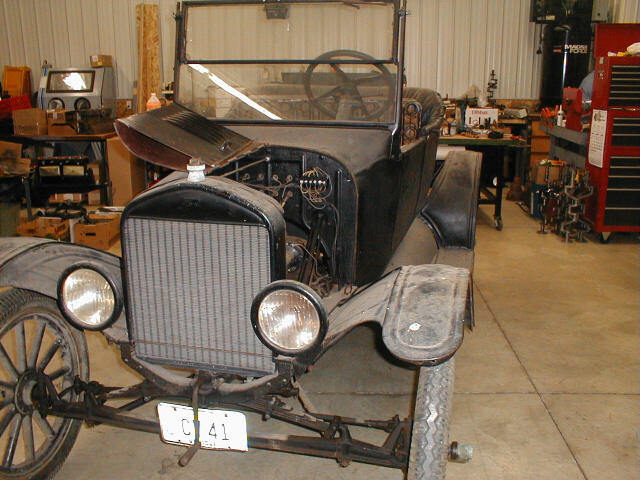 In the never ending search for Model T's, it is sometimes not the finding that is the issue. Sometimes, it is the waiting that we must endure. These two recent additions to Jack's garage are great examples. Jack has been working on a brass era chassis for some time now and has been waiting for just the right body to finish off the project. When we were working on the T-100 project, I could see the sparkle in Jack's eye as he watched Sven putting bodies together in Livonia, MI. At that time, Don Lang told us that they'd be importing the bodies for sale in the states, but the price was a little high. Now that Snyder's has a few bodies in a different style, a deal was made to finally get one of Sven's bodies. Everyone should take a look at the new Snyder's catalog. 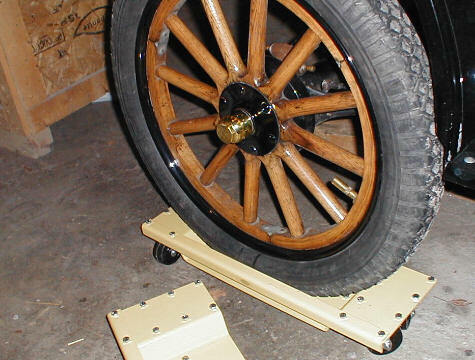 There is a new spare tire mount for a Model T Truck that mounts like the original between the driver's side running board and the top bracket. The other coupe has been a long time coming. This car was looked at many years ago when the owner was selling another car. He had decided to keep this car because it was his everyday driver. Jack told him that "if he ever wanted to sell it to let him know". Well the car was all but forgotten and, as everyone knows, Jack has continued to collect and restore cars. Right after he came home with the Swedish 1914 Coupe body, he got the call from the aged gentleman with the news that he'd decided to let his everyday driver go for a yet to be determined price. A price was set and there it sits in the middle of the meeting room. There may be a plea for more storage space in the near future. The building that was built a few years ago to house the collection is now too small for all of the vehicles. I've suggested a second story. Call Jack with any ideas. He'll likely have a talk with me about this article. Show a little pity on a poor editor. Another new car has been years in the coming. The gentleman that owned this one finally decided to sell. 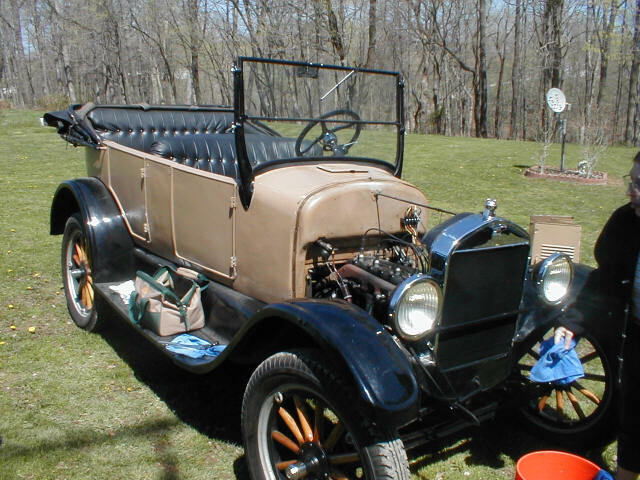 The Ford Motor company would like as many Model T's as possible at an event that they have scheduled for May 16th at the Botanical Gardens of Toledo, Ohio. The Botanical Gardens is located in a nice residential area near the intersection of US475 and SR120 on the west side of Toledo. They would be interested in our cars, any historical display that we can create and possible rides in our cars if we are willing. Beth Siroskey, my contact at Ford, has set us up to be in a separate lot off of Bancroft Street. The public will enter through a different lot. Ford will be serving lunch for the car club members. Beth has also promised some type of trinket for the occasion. I suggested flashlights to check our gas tanks. It would be nice to have a good turnout for this event. I'll have maps to the event at the May meeting. If you will not be at the meeing and would still like to attend, give me a call at (419) 927-4150. 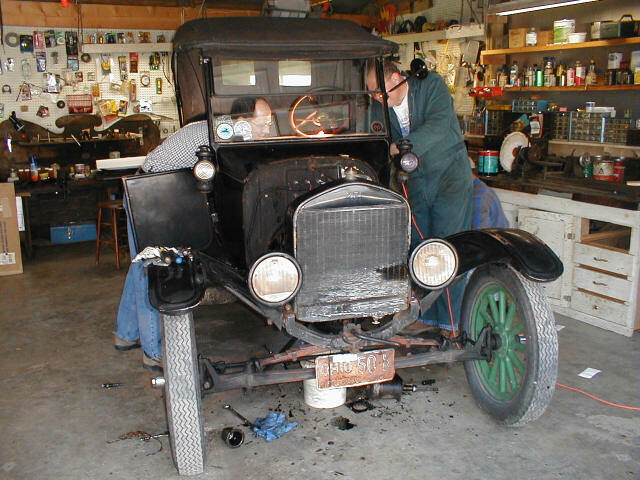 Remember, our club was formed to preserve and maintain Model T Fords of ancient age and historical value and to serve as an accurate and technical source of information concerning Model T Fords for the benefit of its members as well as the general public. I would like to talk to you about an event that we are planning to celebrate Ford's 100th anniversary and we would like your club to be part of it. I see that Ford Motor Co. has contacted you for this month's event in Toledo. 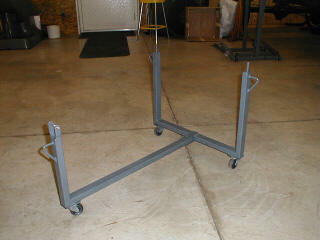 Our sales manager, Mr. Joe Cajka has also contacted Mr. Hollister as well as Mr. Mack about this. Naturally, all Ford enthusiasts wish that they could be in Dearborn to commemorate the company's 100th anniversary in June. For those unable to travel to Michigan this spring, Findlay Ford Lincoln-Mercury will host a smaller scale celebration. We will have commemorative anniversary buttons to give to all your club members who participate and we are thinking of other ideas. such as trophies or plaques, or better yet centennial memorabilia. We have chosen Saturday, June 14th for our event date, here in our dealership. We will provide lunch for your club members, Stan himself may be out there grilling hamburgers and hot dogs. Will your club be interested in something like that? We are open to any suggestions you might have, since you have been involved with more events of such nature(car shows, etc). 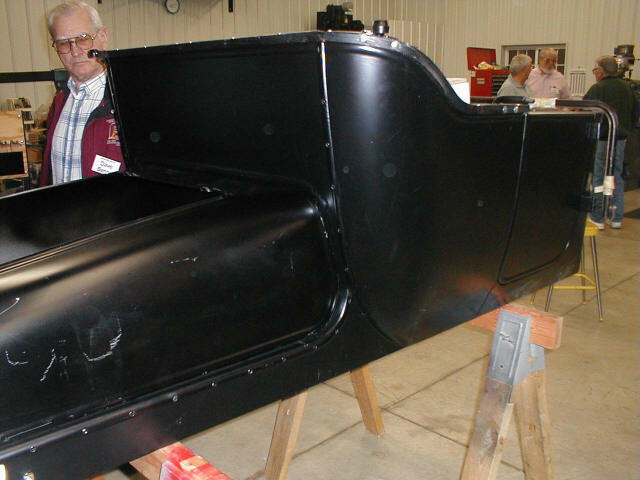 What will be appealing to your club in order to assist us in this event and to give the opportunity for the public to see the club's preservation of the Model T? We had floods of calls last year, after you stopped by for a short while in our dealership, people were hoping that you will be here longer so they can see this amazing vehicle. I have been working on our dealership's newsletter for quite some time now and been doing articles on the Ford Motor Co. since April 2002 and I'm amazed by Henry Ford and his wisdom. Looking forward to hearing back from you.